After seeing the best, animated, fighting owls, kids' movie ever, it was time to grab dinner with Happy Meal, and we were in the mood for a drive, so we headed out to Eagle Rock to sample the oft-lauded Oinkster. 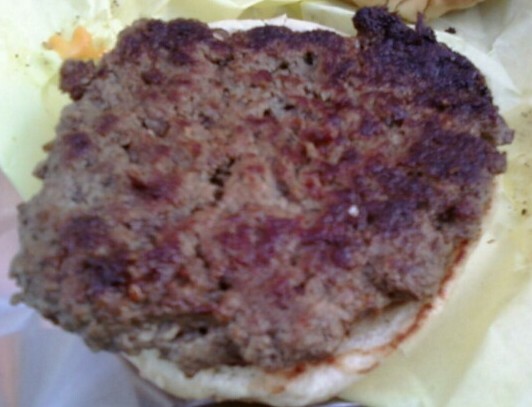 The collective opinion of 1028 Yelpers was that Oinkster was a solid 4 stars--how could 1028 Yelpers have been wrong about this cheeseburger?............Well, it went something like this. The Beef: 100% Angus from Nebraska. The cut? No one behind the counter knew, but judging from the blandness, I'd say that it was 80/20 Chuck. Chuck peppered with connective tissue. The beef had not a hint of aging, but it did have a satisfying iron taste--other than that, it was completely insipid. It came out not completely dry, so a couple of points for that. I would guess that this beef showed up frozen in 5 pound plastic tubes from a facility in Nebraska. When this product is allowed to sit in a thawed state for more than 48 hours, it begins to leak out fluids and flavor, and, in turn, this leads to dryish, bland burgers. That's pretty much what we got at Oinkster. The Preparation: Griddled hot to Well Done. They rendered out the majority of the fat and the remaining flavor, sadly. The grind was coarse, and the irregular patties were formed loosely, so that the mouth feel was loose, meaty, and crumbly. As you can see in the photos, none of the juices reached the bun. This truly teetered on the edge of dryness. The Seasoning: There was a vague taste of salt on the outside, and NOTHING on the inside--nothing but bits of gristle. 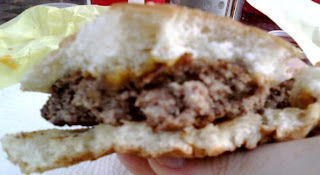 The Sear: It was a bit uneven, but the 1/3 pound patty could not have tolerated much more heat. The griddle imparted a nice crunch to the spots where there was sear, and that was a nice contrast in texture. Again, since there was no seasoning and there was not much by way of juices, the sear on this bland beef was not flavorful. The Cheese: Nicely melted American. The Bun: The (spottily) seeded, hamburger bun was barely toasted. It must have come from a specialty bakery, because only a specialty bakery could turn out a product this useless. The bun was bland and flimsy. It simply fell apart and away from the burger patty as it was being eaten, and I used no condiments. Happy Meal fared worse, because his pickles and ketchup added moisture and weight to the already WEAK bun. He was displeased. The Meat to Bun Ratio: Hard to tell since the bun was in the business of disintegrating, and business was good. If I'd had to guess, I'd say it was correct for a single, but way too little bun for a double. The Fries: YECH...they called them "Belgian Fries," so I can only assume that "Belgian" was code for something that is greasy, lank, and undesirable. The fries were very "Belgian." They were also unsalted. Finally, there were two ketchup choices...house-made ketchup and a chipotle ketchup. Neither of these choices was worth a damn, since both were heavy on the acid and sweet flavors which created an overly "bright" taste to them--a lot like sugary, malt vinegar. Neither of these so-called ketchups featured the customary hearty, tomato flavor, which is why one uses................................ketchup. The muted, sturdy flavor of a Heinz would have been much preferred. 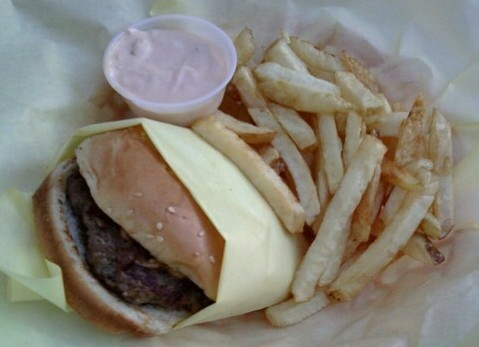 The concept at Oinkster was high-quality, American, comfort food. They called it "Slow Fast Food." In practice, the Oinkster quickly delivered an assemblage of so-so ingredients that comprised a bland and mediocre whole. 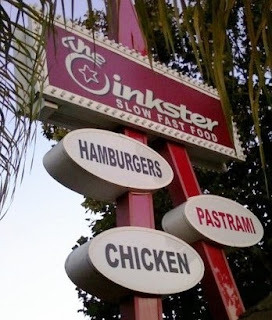 If you live in Los Angeles, you can safely skip Oinkster--you'll save money on gas--you will miss out on nothing. The value was poor--18 bucks for 2 baskets of bland and a couple of cokes. 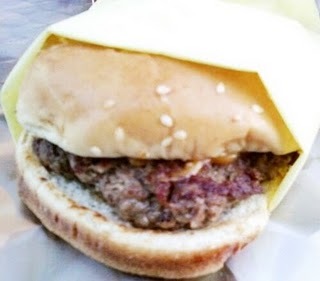 Burger Review : This was the Obama of cheeseburgers--Popular, Full Of Promise, Talked A Great Game, Over-Priced, Impressive (at first glance), Bland, and it generally Under-Performed. It was truly nothing to be proud of, and it is even more doubtful that it will be tried again. 3 of us went there this past Sunday, the fries were ok. Too many kids running around and pulled pork was not that good, nothing to go back for. I wish I had your discipline Pete. I don't know how you resist all the delicious condiments and sauce that usually come with burgers. We should all appreciate immensely your commitment to the scientific approach which eschews extraneous factors. Factors we all love like well-made Thousand Island, herb mayo, spicy in-house mustards, etc. I found your review of The Oinkster here to be accurate. Though I did like the burger. Primarily because it was dripping in tasty "Thousand Island" sauce and great pickles. But again, to my earlier point, such luxuries obscure accurate analysis. I'm an unserious bum. As with your friend's bun, mine dissolved as well. And the fries were just as crappy as you said. The only good thing about the fries was reading your hilarious take on them. The beef did have a nice salty tinge to it. I didn't have a huge problem with the beef. For a Roadside Style Burger, I was pretty satisfied with it. I cut them some slack because this is more of a pastrami / pork place.